TAUNTON, Mass. – For the 11th-seeded Durfee Hilltoppers, the third time was the charm. 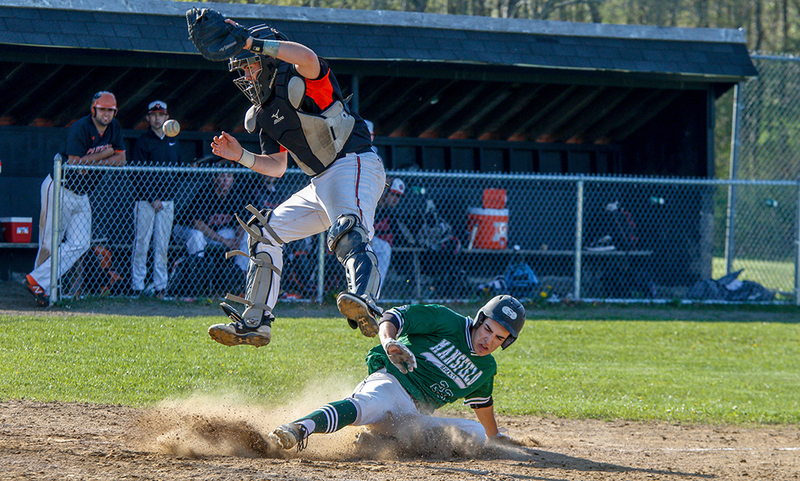 The team from Fall River defeated #6 Taunton Tigers, 7-6, in the first round of the MIAA Division 1 South tournament on Thursday, after the Tigers had taken the two regular season meeting games against their non-league rivals this year. The Hilltoppers put up three runs in the third and four in the fourth to forge their path to victory. The visitors saw important offensive contributions from several players, including second baseman Nate Ladeira, who went 3-for-3 with three singles, two runs, a walk and an RBI. Right fielder Remy Dumont also impressed for the visitors, going 2-for-3 with a run, a walk and a stolen base. On the mound, starter Tommy Lambert took the win, going 5.2 innings giving up nine hits, six runs, and two walks while striking out five. In relief, third baseman Ethan Ferreira moved over to the mound and tossed 1.1 innings giving up a hit and a walk while striking out two. For the Tigers, a handful of players impressed at the plate, starting with the leadoff batter, center fielder Trevor Pietrzyk, who went 2-for-3 with two runs, a walk, and two stolen bases. Designated hitter turned pitcher Tyler Medeiros also went 2-for-3 with two runs, in addition to a double and two RBI while left fielder Logan Lawrence went 2-for-4 with a three RBIs, a run, and a home run. For the Taunton pitchers, starter Jack Moynihan gave up three runs, four hits and a pair of walks while striking out three for the no decision. The loss was charged to reliever Josh Lajoie. Medeiros finished the game for Taunton, giving up three hits, a run (unearned) and a walk while striking out three in 3.2 innings. The game began fairly the same for both teams, as they both lead off the first with hits only to see themselves come out of the inning scoreless as the pitchers battled back. Durfee put themselves on the board in the top of the third inning as Ladeira walked, Dumont singled and left fielder Lucas Sousa was hit by a pitch to load up the bases for the Hilltoppers. In that scenario, first baseman Curtis Perry delivered a double that scored the first two, and a wide throw to the plate by Lawrence that went out of bounds allowed Sousa to cross the plate and gave the visitors a 3-0 lead. The Tigers, however, were quick to respond. Right fielder Evan Melo and Pietrzyk hit back-to-back singles, and an overthrow on a steal attempt allowed Melo to come home, and Medeiros drove in Pietrzyk a batter later to make it 3-2. On the next at-bat, a double deep to right by Lawrence some Medieros come home all the way from first, tying the game back up at 3-3 as the third inning came to a close. Lajoie took over on the mound in the fourth inning but ran into some early trouble, hitting the first two batters he faced and gave up an RBI single to the third, Ladeira, to give Durfee a lead they would never relinquish. A wild pitch advanced both designated hitter Brett Fonseca and Ladeira into scoring position, in time for Dumont to send them both home off a deep single to the left center gap, making it 6-3. After the hit, Medeiros took the mound in relief. An infield single bunt by Lambert plated Dumont, and the Hilltoppers came out of the inning with a 7-3 lead over their hosts. The Tigers still were hungry, and not ready to go down without a fight. In the bottom of the fifth Pietrzyk drew a one-out walk and stole second to put himself in scoring position. A hard-hit double by Medeiros drove the outfielder in, and he himself would cross home as Lawrence sent a deep shot over the left field fence by the foul pole for a two-run home run, leaving the Tigers trailing the Hilltoppers by just a run. That run, however, would never come for the hosts. After threatening with second baseman Griffin Tomaszycki on third, Durfee swapped their starter for Ferreira, who closed out the inning and kept the Taunton mostly at bay for the next couple of innings. For the Tigers, Medeiros was able to get himself into a groove, including striking out three out of four batters he faced during one strand. The Hilltoppers nearly added another run in the top of the seventh as Ferreira tried tagging up to home on a Fonseca pop out to left, but Lawrence had different plans as he sent a strong, accurate throw to catcher Andrew Gomes at the plate to beat the runner and turn a routine fly into a double play. Durfee moves on now to the MIAA D1 South Quarter Finals, where the #11 Hilltoppers will be challenged with a trip to #3 Wellesley on Monday. TAUNTON, Mass. – Mansfield senior Tyler Dalton found himself in an unusual spot on Monday afternoon, looking to bounce back after a tough outing in his last start. 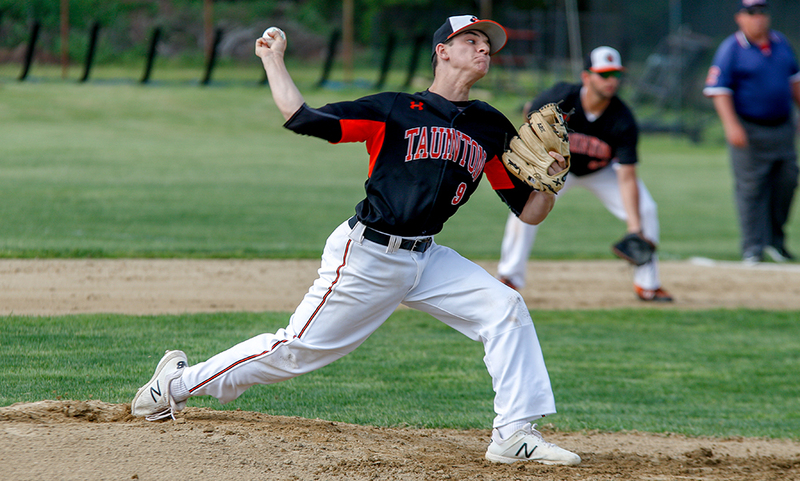 Dalton allowed nine runs – six earned – in his previous start on the road at Oliver Ames. But with a chance to bounce back, Dalton was at his best. 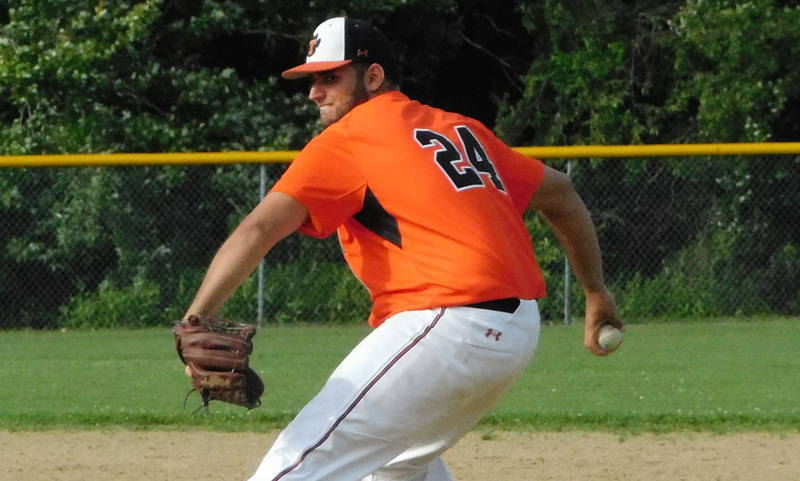 The senior right-hander allowed just two hits — only one out of the infield — while striking out 10 and walking just one in a complete game effort, helping the Hornets pull out a 7-2 win over Taunton. Dalton limited Taunton to one hit in the third and one in the fourth, the two innings the Tigers scored single runs. Beyond that, he faced the minimum in the first, second, fifth, sixth, and seventh. Taunton had a runner in the second (HBP), but he was erased by catcher Cullin Anastasia trying to steal second. He also recorded at least one strike out in every inning, getting a pair of Ks in each the second, third, and sixth innings. After a pair of scoreless innings, Taunton finally broke through in the bottom of the third. Griffin Tomaszycki battled back from down 0-2 in the count to lead off with a walk. He then took second on a ground out from Andrew Gomes and came around on a sharp grounder down the first base line from Josh Lajoie to make it 1-0. Mansfield got its first two hits of the game in the top of the fourth with Dan Saraceno and Dalton both singling. Dalton and Kevin Dow (reached on fielder’s choice) got to second and third with two outs but Taunton starter Jack Moynihan got the final out to prevent any damage. Taunton added to its lead in the bottom of the fourth. Senior Jacob Crawford reached after an infield error and took second when he beat the throw on Tyler Medeiros’ ground ball. With two outs, Tomaszycki hit a hard ball to the left side of the infield for a single, but the throw was off which allowed Crawford to come home from third to make it 2-0. But the lead didn’t last too long as Mansfield responded in the top of the fifth, with a little help from the Tigers’ defense. Justin Pena’s single was followed by Chris Jenkins’ grounder, which resulted in a fielding error and then a throwing error. Pena moved all the way to third and Jenkins to second. Mike Hargadon drove Pena in with an RBI ground out, and a couple of pitches later Jenkins took third on a passed ball and scored on a two-out single from Sam Nugent to make it 2-2. Mansfield’s offense continued in the top of the sixth inning. Dalton drew a one-out walk, ending Moynihan’s day on the mound. Dalton took second on a passed ball and scored on a hard hit ball by Anastasia, who took second on the throw to home. With Anastasia taking off, he came around to score on another infield error to make it 4-2. The Hornets put the game out of reach with three insurance runs in the top of the seventh inning. Saraceno was hit by a pitch with one out and moved all the way to third on an errant pick off attempt. Dow drove Saraceno in with an RBI single. Another error proved costly for Taunton as Anastasia was able to reach and Dow came all the way around make it 6-2. Anastasia took third on that error and came home on a line drive single from Pena. Despite suffering the loss, Moynihan pitched well, allowing just one earned run in 5.1 innings of work, four hits, one walk, and three strikeouts. Mansfield baseball (6-3 Hockomock, 8-3 overall) will try to extend its win streak to five when it hosts Attleboro on Wednesday afternoon. Taunton (5-4, 8-4) will try to bounce back the same day when it hosts Franklin.